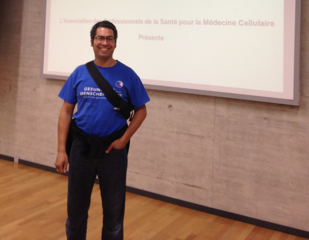 It is often asked who is the scientific advisor, well, my name is Fabrice and I am a Swiss Naturopath. I graduated from the Naturopathic School of hygiene and natural medicine "IHMN" and works in Saint-Maurice as a therapist and health consultant. I believe that the world needs a new health system and that people need to be more informed and educated in basic health in order to stay healthy physically and mentally. My goal in supporting www.my-vitamin-advisor.com is to help improving the quality of the nutrients and food supplements that are sold to us all. Alone it is impossible to do but imagine that a product contains titanium dioxide and that it gets a very bad reviewing&rating on our site, it could put some pressure to the manufacturer to get rid of it or to improve the content of the product. This site will give the power back to the people in order to bring a new health solution with only good supplements at a very good price. I do hope that in the future those nutrients should be given back from earth but at the moment unfortunately the soil are so depleted so we have no other choice than include good natural supplements to our daily diet.